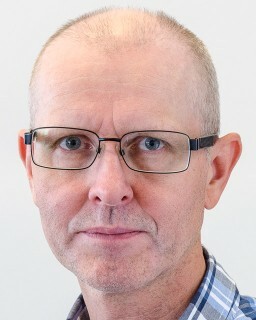 Karl Skretting was born in Nærbø, Norway in 1962. He is married to Anita and they live in Sandnes. Some pictures of them and their daughters, Maria and Anne, are available on the WWW. Karl started to study signal processing at University of Stavanger (UiS) in 1996, the name then was Høgskolen i Stavanger (HiS). He received his siv.ing. (M.Sc.) degree from the Electrical and Computer Engineering Department in 1998. In 2002 he received the Ph.D. degree. Currently, he is employed as associate professor at UiS, and he is a part of the Cybernetics Group. The topics of interest are signal representation, data compression, and computer graphics. See also the Dictionary Learning Experiments, DLE-page. EURASIP Journal on Applied Signal Processing, Volume 2006 (2006), Article ID 52561, 11 pages. SCIA 2017, 12-14 June 2017, Tromsø, Norway. Matlab m-files available on DLE page. ICIAR 2014, 22-24 October 2014, Vilamoura, Portugal. More info on the Texture Classification Tools TCT page and the result page. SPIE 2011, 21-25 August 2011, San Diego, California, USA. More info in the properties section in DLE page. 2011 IEEE International Conference on Acoustics, Speech, and Signal Processing (ICASSP 2011), 22-27 May 2011, Prague, Czech Republic. Proceedings ICASSP 2011, IVMSP-P15.4, pages 1517-1520. Tapir Akademiske Forlag: Proceedings NORSIG 2005, ISBN 82-993158-7-5, pages 53-58. Tapir Akademiske Forlag: Proceedings NORSIG 2005, ISBN 82-993158-7-5, pages 35-40. 2005 IEEE International Conference on Acoustics, Speech, and Signal Processing (ICASSP 2005), March 18-23, 2005, Philadelphia, PA, USA. Proceedings ICASSP 2005, ISBN 0-7803-9076-8 (8874-7), Volume IV pages 585-588. Denoising of images using designed signal dependent frames and Matching Pursuit. Proceedings ICASSP 2005, ISBN 0-7803-9076-8 (8874-7), Volume II pages 653-656. Implementations of the algorithms are available as Matlab-files that you will find on the DLE-page together with some relevant information. A Novel Image Denoising Technique Using Overlapping Frames. SCIA 2001, Bergen, Norway, June 11-14, 2001. Design of signal expansions for sparse representation. NORSIG 1999, in Proc. of Norwegian Signal Proc. Symp., Asker, Norway, September 1999. Design of general block oriented expansions for efficient signal representation. ISCAS 1999, in Proc. ISCAS, (Orlando, Fl., U.S.A), pp. III-9-12, May 1999. Dictionary Learning Experiments, DLE, the latest functions for Matching Pursuit and Dictionary Learning. Sparse Signal Representation using Overlapping Frames, the old page for Matching Pursuit Algorithms and Matlab-files for Frame Design, i.e. Dictionary Learning.